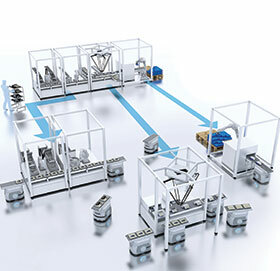 Omron’s i-Automation ‘Innovation in Manufacturing’ drive is focused on intelligent, integrated, and interactive automation to increase overall plant proficiency. The company functions as a partner to customers help innovate global manufacturing. Through its expertise in sensing and control technology, it enables manufacturers to operate with greater productivity and streamlined efficiency. • Automation systems – IPCs, machine automation controllers, PLCs, remote I/O and HMI. • Motion and drives – motion controllers, CNC, servo systems and frequency inverters. • Robotics – industrial robots, linear axis control and mobile robots. • Quality control and inspection – inspection and indent systems. • Sensing – photoelectric sensors, mark and colour sensors, light curtains and area sensors, fibre optic sensors and amplifiers, inductive sensors, mechanical sensors/limit switches and rotary encoders. • Safety – emergency stop and control devices, safety limit switches, safety door switches, safety mats, safety sensors, safety logic control systems and safety outputs. • Control components – temperature controllers and sensors, power supplies, UPSs, timers, counters, programmable relays, digital panel indicators and energy monitoring devices. • Switching components – electromechanical relays, solid state relays, low voltage switchgear, monitoring products, pushbutton switches and thermal blocks. • Software – CX-One, Sysmac Studio, CX-One Configurator FDT, CX – Drive, CX-Thermo, Trajexia Studio, CX-Supervisor, CX-Server OPC, CX-Compolet/Sysmac Gateway, NS Runtime PC and Kepware OPC Server. Omron is at the forefront of seamless input/logic/output technology, delivering connectivity that is reliably, fast and completely transparent. High performance, effortless integration, total safety and rapid time from concept to market ensure overall plant efficiency.